One in five Americans has some sort of disability according to a study done in 2008 by the Centers for Disease Control and Prevention. This could include disabilities having to do with hearing, sight, mobility, learning, development or mental health. But not all disabilities are perceived the same way. Drew Graham has a unique perspective on this. He has both a physical and mental disability and has determined over the years that the stigma associated with mental disability carries more weight. On December third, 1982, 15-year-old Drew Graham and two friends were on their way to watch a college basketball game. About halfway from Louisiana, Missouri, to Hannibal, the friend who was driving drifted off the road, lost control of the car and ran into an oncoming truck. The car carrying Drew and his friends hurled down a 35-foot embankment into water. “And I thought, ‘I better try to get up and get out of here.’ Well, I tried to put my hands down and nothing worked so I got the idea pretty quick that I had broken my neck and was paralyzed,” Graham said. Drew had partial paralysis. That meant he had to get a specialized bed and adjust to life in a wheelchair. His small town community made an effort to be understanding of his condition. “With my physical handicap, they can see that and they know how breaking the neck and injuring the spinal cord… hence you wind up in a wheelchair,” Graham said. The adjustment took a toll on Drew’s mental health. “I started to get depressed when I was back in school. There was a lot missing in my life not having sports anymore and you know and the different things that you can do as an able-bodied person compared to someone with a disability,” Graham said. A year after his accident, Drew was hospitalized again — this time in the psychiatric unit. There he was diagnosed with bipolar disorder, a mental illness involving extreme high and low mood swings. He spent the next six months at Barnes-Jewish Hospital in St. Louis trying out different medications. When he got back home, Drew knew the response from his community would be a lot different from the first hospitalization. “If they knew I was hospitalized in a mental ward, I don’t think they would have understood. So I didn’t bring it up that often,” Graham said. Some of his aunts and uncles didn’t even know he was seeing a psychiatrist. “They don’t know that most people with their mental illness it’s easily controlled by medicine. It’s not like they’re a stark raving lunatic,” Graham said. When friends first found out about his diagnosis, they weren’t sure how to react. “It’s kind of like they’re walking on eggshells. They think that something they say might set you off to do something,” Graham said. Through medication and therapy, Drew has learned to better manage his bipolar. Still, it is a continued struggle both physically and psychologically. 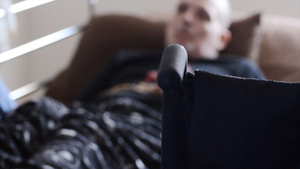 Three decades later, Drew still relies on a wheelchair and a hospital bed. He has also seen changes in society’s view of mental illness. “I don’t think there’s as big of a stigma as there was 20 or 25 years ago. I think that people with depression or different mental illnesses like that don’t feel like they have to stay hidden anymore,” Graham said. He has learned how to be patient with friends’ awkward question and overly nervous attitudes. But he still says mental disability carries more stigma than physical disability. “I think even today, it’s a topic most people aren’t that comfortable talking about,” Graham said. As people spend time to get to know him, Drew says they begin to understand that his disabilities don’t define him. They are just a part of who he is. This story is part of Project 573, a project that provides innovative journalism that expands awareness and broadens perspective about a localized issue.